Solar supporters gathered at North Gate Vineyard for the Solar Celebration in Northern Virginia on Friday, December 1, 2017. On Friday, December 1, nearly 40 solar supporters joined Solar United Neighbors to celebrate recent solar successes over drinks and snacks. 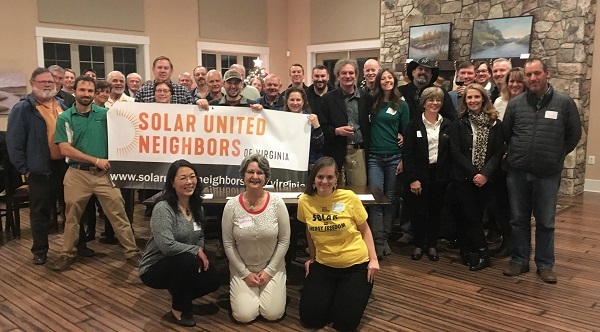 The event brought together solar homeowners, past co-op members, local solar contractors, community members interested in going solar, and others at North Gate Vineyard in Purcellville. North Gate is a LEED Gold certified winery with a 22 kW solar array, one of dozens of local businesses that have gone solar! Solar United Neighbors of Virginia Program Director Aaron Sutch kicked off a brief presentation by reviewing several years’ worth of solar success, including helping more than 600 homes and organizations go solar across the state and mobilizing our growing constituency of solar supporters to achieve recent policy wins. He also talked about our new name—VA SUN became Solar United Neighbors of Virginia in October—and energized the room with our ambitious vision for the future of the organization. That future includes our new membership program, which will allow us to expand our army of solar supporters working together to build an energy future where people, not big corporations, own and benefit from clean solar power, microgrids, and electric vehicles. 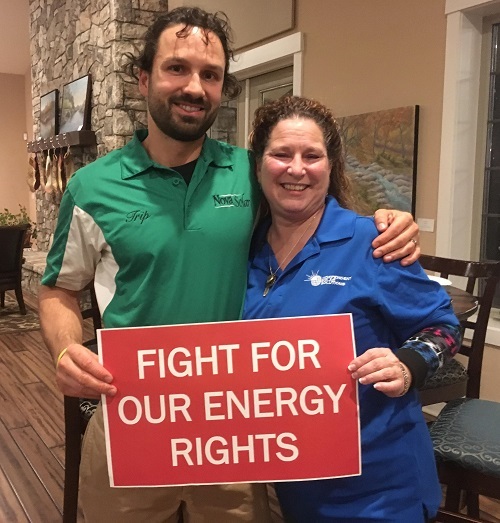 Solar supporters in Virginia know that when we join together and fight for our energy rights, good things happen! Aaron also introduced North Gate’s owner Mark Fedor, who spoke about the vineyard’s commitment to going solar and their other sustainability efforts, and Ben Glenzer of Solar Solutions For All, who talked about North Gate’s unique roof-integrated solar panels. Thank you to everyone who joined us for the event, and thank you to the volunteers, Solar United Neighbors staff, and to our hosts at North Gate for supporting solar and making the event a great success. Connect with our growing community of solar supporters by attending an event!